In 1983, Wiley Rein LLP opened its doors with 39 attorneys and a mission to establish a distinctly Washington, DC firm providing exceptional, effective legal services and genuinely superior service. In December 2014, Wiley Rein acquired SIGNAL Group (formerly McBee Strategic Consulting, LLC) as a wholly owned subsidiary, creating a Washington, DC legal, advocacy, and communications powerhouse. 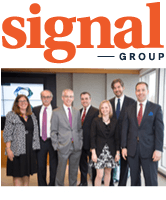 SIGNAL GROUP: Wiley Rein acquired SIGNAL Group (formerly McBee Strategic Consulting, LLC) in December 2014. Wiley Rein routinely represents clients before more than 40 U.S. government departments and federal agencies. Click to view Wiley Rein's U.S. Government Departments and Agencies Firm Directory. WILEY REIN CLIENTS: Wiley Rein clients—across the nation and around the world—include Fortune 500 corporations, trade associations, and individuals with significant business interests. Wiley Rein was awarded ISO 27001 certification as of May 1, 2018 – one of a select number of law firms to achieve this highly respected certification for information security management. The certification reflects the firm’s compliance with rigorous international standards and best practices, and its robust approach to protecting client data. Wiley Rein was granted the certification after an independent, comprehensive, year-long review of the firm’s information security and risk management processes and procedures. The review process involved a multipronged audit by the British Standards Institute (BSI). In addition, the firm also complies with requirements in several NIST (National Institute of Standards and Technology) guidelines. ADDITIONAL INFORMATION: Learn more about Wiley Rein’s Diversity and Pro Bono initiatives.